The Walt Disney Co.'s international TV licensing arm, Disney-ABC International Television just signed a major, multiyear deal with Channel One, the Russian state-run television network. The deal will include movie titles, live-action series, animated series as well as telefilms. Also of note is the launch of a monthly family film timeslot for "The Wonderful World of Disney." Some of the movie titles would include "Dead Man's Chest(yeah!) and Wild Hogs(those poor Russians!) as well as some future features. So as well as expanding into formerly Communist China, now the Mouse is looking to create more Disney Geeks that speak Russian. 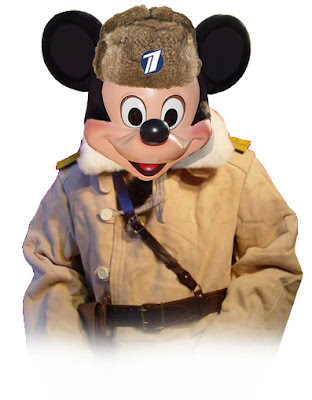 Let's just hope that Vladimir Putin's strong arm tactics don't include muzzling Mickey Mouse. Hey, POTC: Dead Man's Chest could refer to Russia's punishment for speaking out against the government. You never really can tell in this crazy, Disney world. What's that symbol on Mickey's hat? It's the symbol for Russia's Channel One.